Often referred to as the “Island of the Gods”, Bali’s neighbours are Java to the west and Lombok to the east. It’s a tropical paradise of unsurpassed beauty. Just eight degrees south of the equator, Bali has an even tropical climate with average temperatures of 30°C year round. 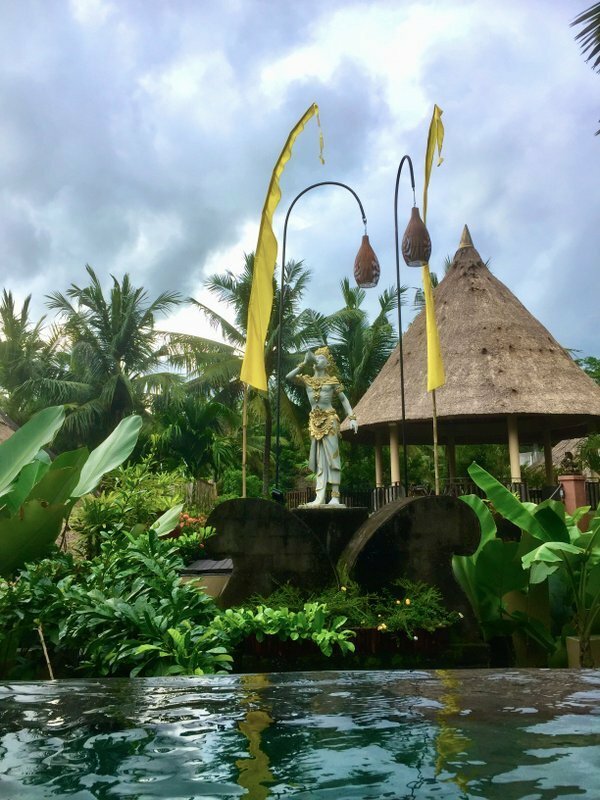 Bali has piqued the minds of travellers for generations; a treasure trove for explorers, the island still retains a special allure with its unique culture, arts, architecture and the warmth of its people. 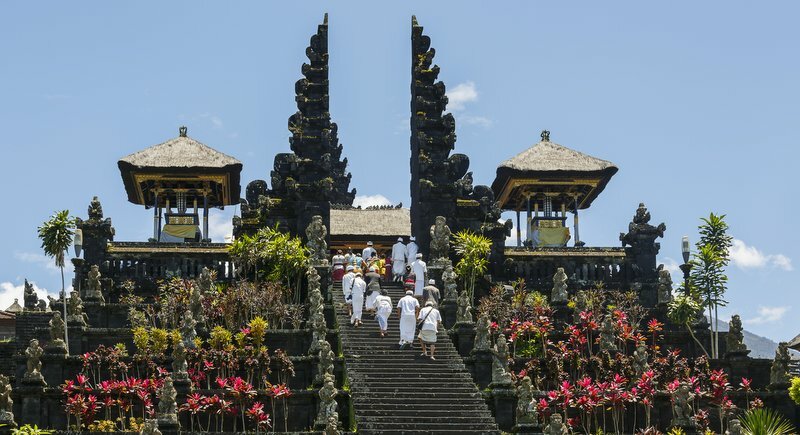 Bali’s population is 4.5 million spread across 5,780 sq km, 145km at its longest point and 80km at its widest. 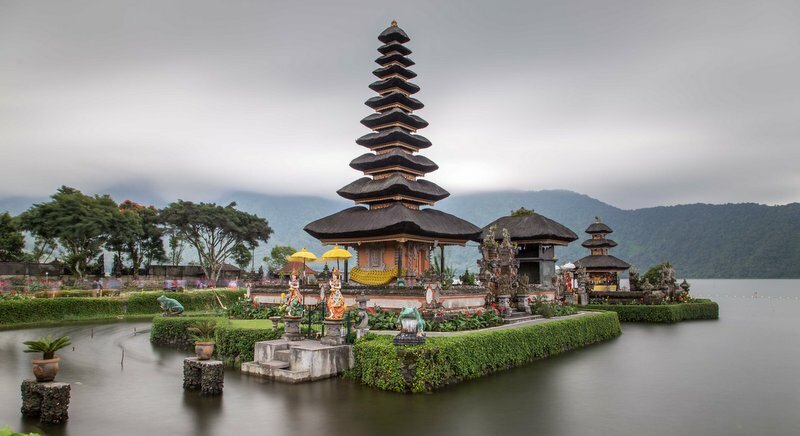 From magnificent mountain jungles to deep valley gorges, rugged coastlines to lush hillsides, black sandy beaches to stunning ancient temples, it’s no surprise Bali is known as the “Island of the Gods”. 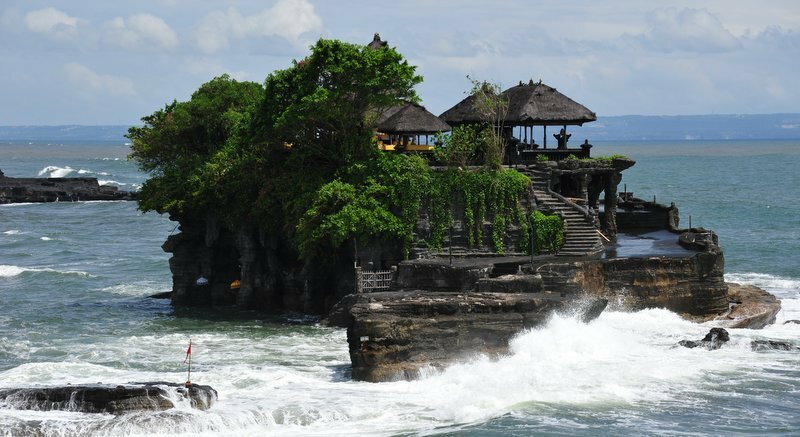 Classic Balinese architecture is omnipresent and the island houses thousands of Hindu temples in every nook and cranny. Black and white cloth is everywhere. On stone statutes; at the front of houses, in temples, worn as a wrap or adorning holy banyan trees. The black and white cloth is called saput poleng. The saput (blanket) poleng (two-toned) is a holy black-and-white chequered textile. The black and white squares represent balance in the universe – similar to concept of Ying and Yang. Equally, the evocative smell of incense permeates wherever people and buildings are found. Unmistakable frangipani flowers, white or red with yellow centres, are used extensively to decorate. Their splash of colour bringing life to static objects, spaces and even people. Daily you’ll see intricately square-shaped palm leaves pinned together with bamboo sticks to form a small flat square tray called a canang sari. They are offered in prayer to appease the gods and ward off evil spirits. Sometimes the offerings includes betel nuts, lime and even cigarettes and sweets. They adorn everything and are placed liberally around buildings, temples and homes. 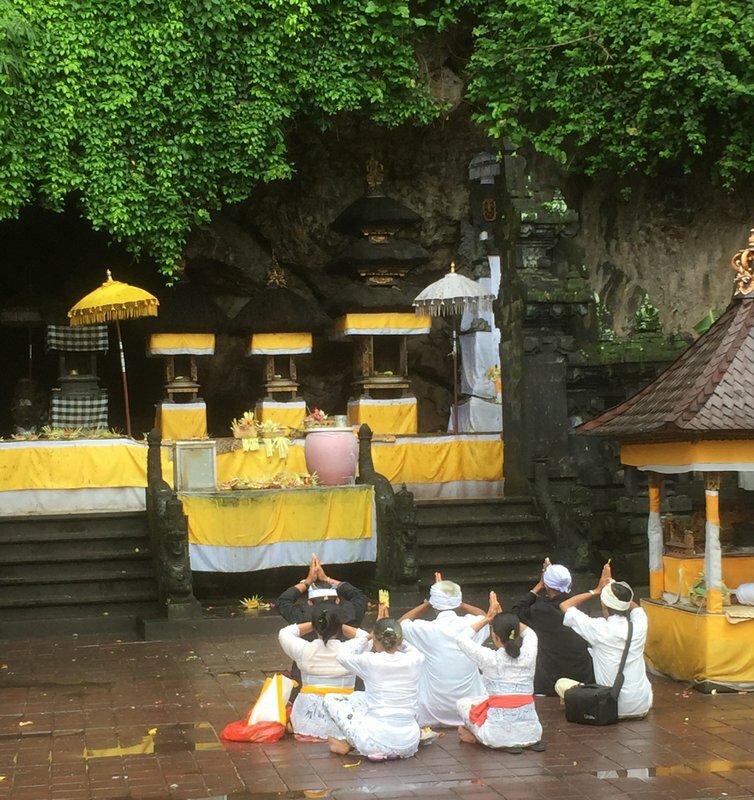 Hinduism is the predominant religion on the island (84%) a rarity in Indonesia’s largely Muslim population (87%). Bali’s tourism success can be dated to the late 1970s. Free spirited travellers explored this beautiful island, especially the beaches that attracted many surfers. Artists and writers flocked here too. There‘s a strong spiritual feel here. The heady mix of rugged mountains and beaches, strong island winds, the waft of incense, the plethora of temples, the flower offerings – and above all the happiness and calmness you experience in your interactions with smiling islanders. They all draw you towards an inner spiritual self. If it’s soul searching and meditation you seek I can recommend no better place. Ubud is my favourite place on the island. I simply wallow in the rustic atmosphere, its greenery, its mountains, its village and its undeniable charm. Each morning there I woke to silence punctuated by a cacophony of morning sounds. 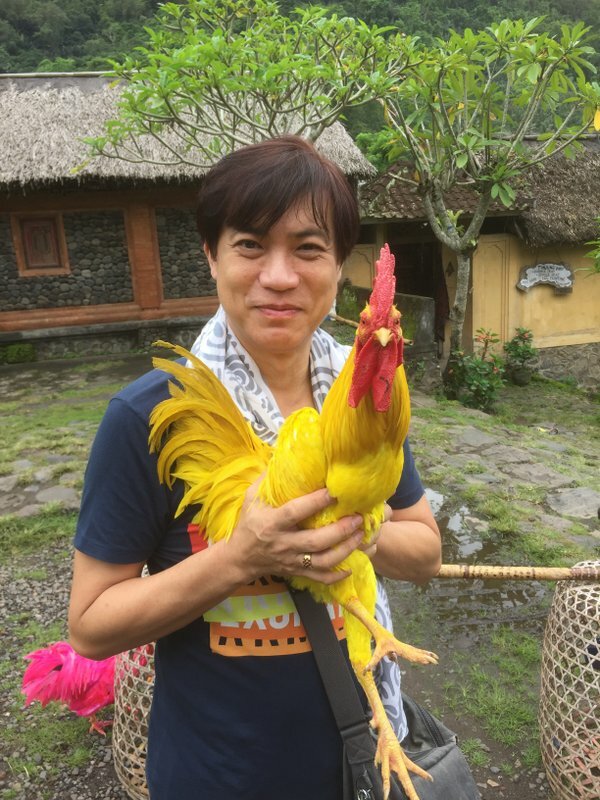 The crowing of a rooster, the rustle of the trees, the sound of distant water falling, a dog barking, a farmer’s tractor. All calming and reassuring. 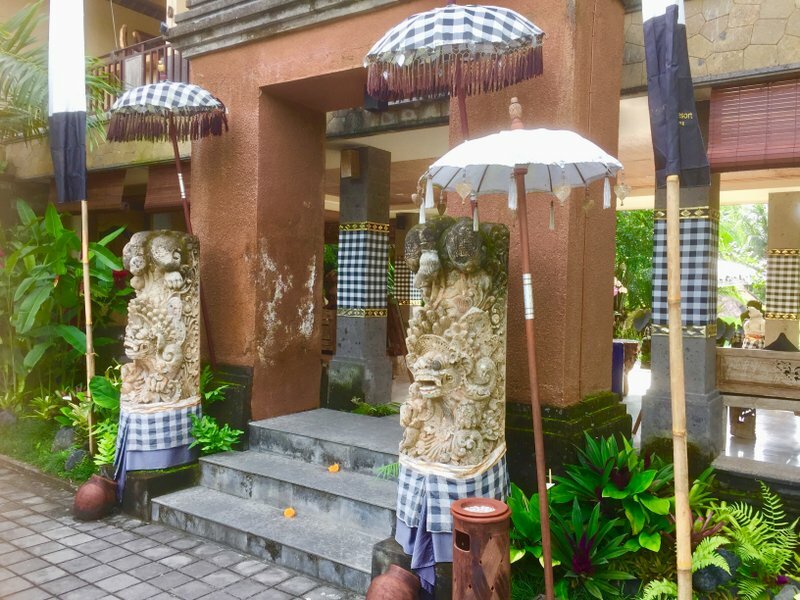 Our first overnight stay was at the impressive four-year-old Sankara Boutique Resort in Ubud. The resort’s layout is centred around the pool and has a forest-like feel. Trees and greenery abound. Our villa had a traditional thatched roof with a high ceiling and a generously sized ensuite bathroom. Access to your villa is a paved walkway through the forest. It’s the friendliest hotel I’ve come across. The staff are genuine and sincere. It has a great kitchen too. Over two days, with the exception of lunch, we had all our meals here. 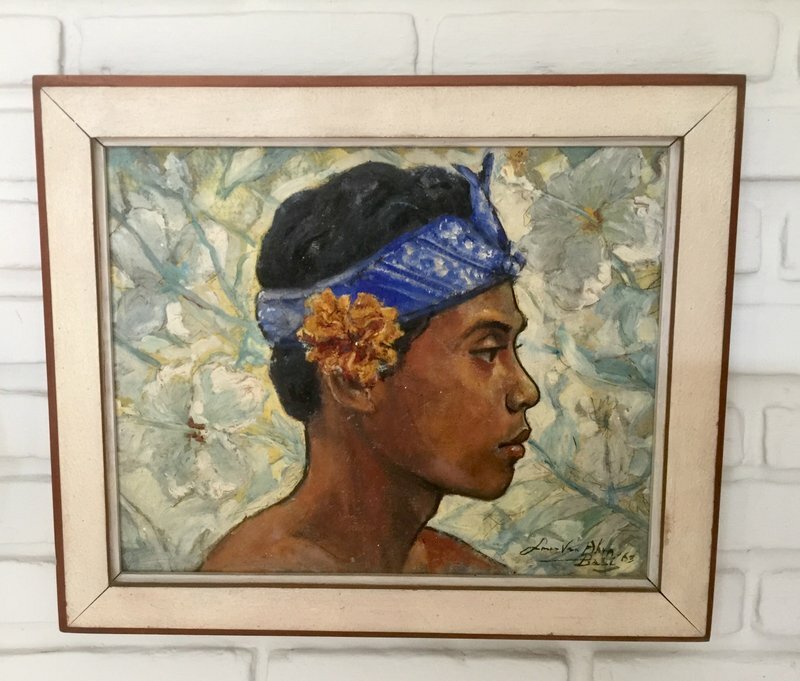 Ubud is Bali’s cultural and artistic heart, it was the destination of choice for artists from all walks of life. 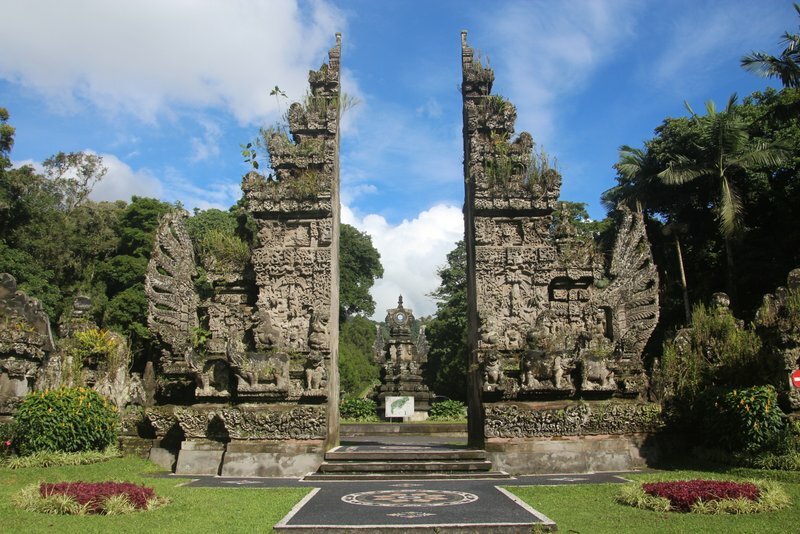 Today Ubud is a small town with an emphasis on wellness, small local shops and great cuisine. At night the bars and restaurants come alive. There’s a real buzz. We continued to explore Ubud the following day and spent the morning with an outstanding local musician. We were privy to a private recital and a face-to-face meeting with one of Bali’s most famous recording musicians. We visited him at his home in a small village in Ubud. His music was relaxing, spiritual and mesmerising. We stayed for about one hour. He is a kind, unassuming gentleman. His wife surprised me by presenting me with a collection of all four of his albums. He plays from memory. He doesn’t read music. After our musical interlude we headed off to a spectacular local home for a very unique cooking class. I believe that one of the most remarkable ways of discovering Bali and any destination is through its people and their culture. Certainly this is the case for Bali. The island and its cuisine are well known the world over. We were invited to take part in a rare culinary experience at the home of a local celebrity. It opened a door to a world that is normally hidden. 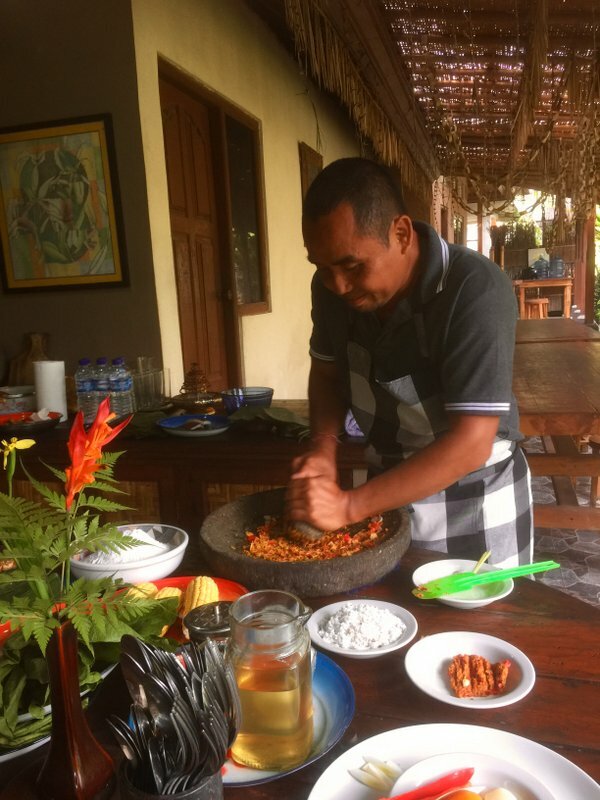 We were introduced to a chef at his sprawling traditional Balinesian home-come-restaurant in Ubud. He only allows seven classes per month and just three in the low season. He believes in a simple lifestyle with little stress. He takes great pains to ensure his work ethos does not negatively impact his family’s well being and his own harmony. What followed was an extraordinary afternoon with a former hotel chef now an entrepreneur, farmer and family man who shared with us his philosophy for a balanced life and sustainable harvesting. It was truly fascinating. After our introductions we were invited to join him in a special cooking class culminating in lunch. It was no ordinary cooking class. Eight dishes were prepared. We chopped, sliced, diced, cooked and even wrote down the dictated recipe by hand. It was serious work and we took great pride to help prepare all the dishes meticulously under the clear instructions from the chef. He was a good teacher, explaining every ingredient and his philosophy that “food is medicine”. We always hope to meet interesting local people when we travel. Meeting this wonderful chef at his home was one of those occasions, a real pleasure. It was day three and after breakfast we checked out of the Sankara Resort and headed east to see the Kerta Gosa, or Hall of Justice, built in the 18th century in Klungkung. It is beautifully laid out within a moat and provides an exquisite example of the Klungkung style of architecture which can also be seen in their ceiling murals. 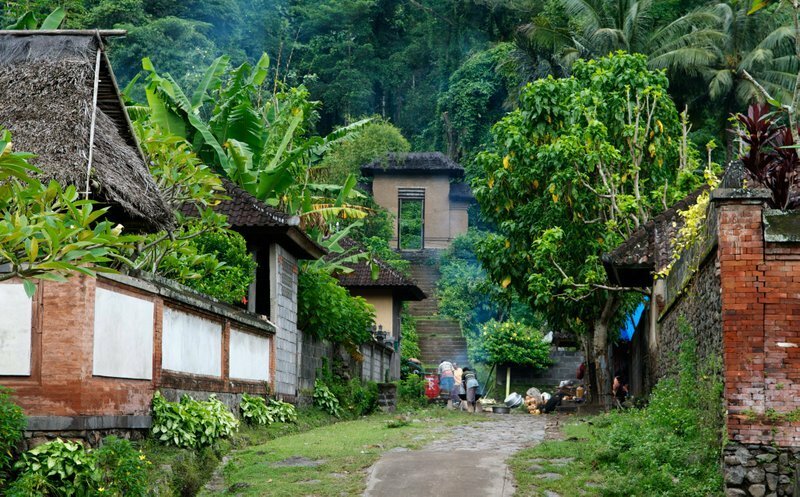 Our next stop was at Tenganan, an original Balinese village, one of the last remaining Bali Aga villages with their own language; traditions and customs that date back several millennia. This includes its famed double ikat weaving. Mr Komdri was on hand to welcome us, bare chested with purple hair he was quite a character. Komdri showed us various samples and explained the techniques for weaving the tie-dyed cotton strands. Each piece of cloth is for sale, a medium piece costs a few hundred dollars. It is considered magical and can ward off evil spirits. It was the weekend and we had dinner in the hotel on our first night. It was exceptional. The following day we had arranged to meet old friends who live on the island. 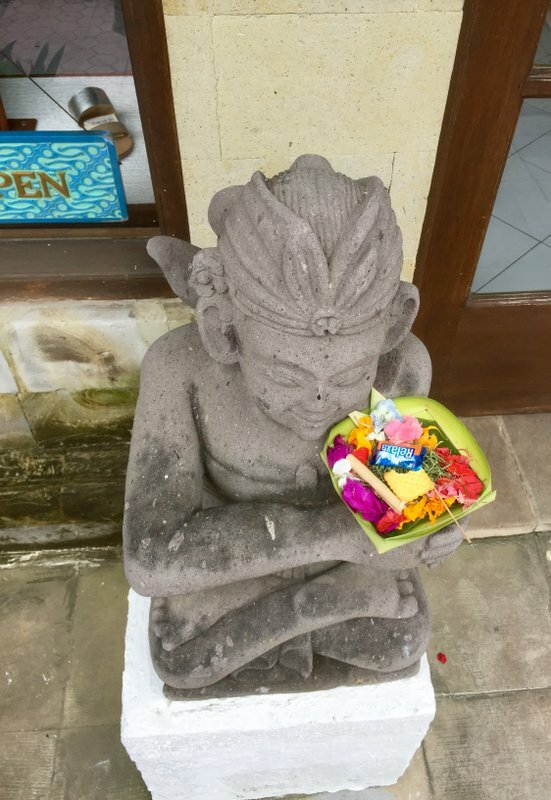 We had a day of eating and shopping in Ubud. Very relaxing. I particularly enjoyed Bridges Bar and Restaurant and Naughty Nuri’s for BBQ. On Monday morning we were met by our Khiri tour guide Mr Sana and a driver who whisked us away to visit to the world famous Jatiluwih – perfectly manicured terraced rice paddies. 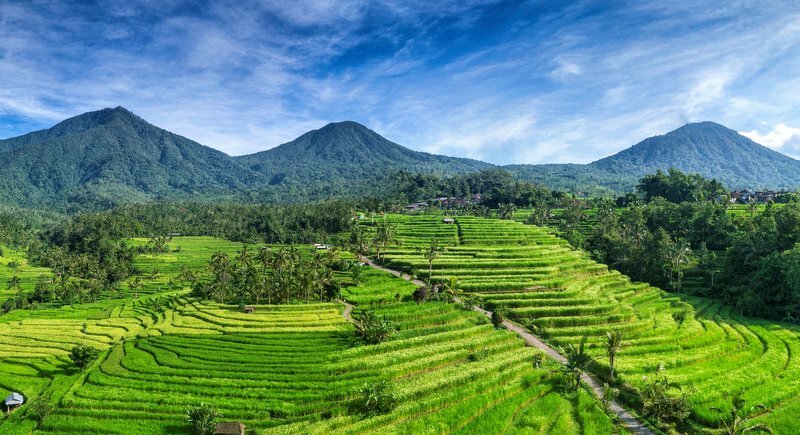 Beautiful and pristine, the Jatiluwih Rice Terraces are just spectacular. 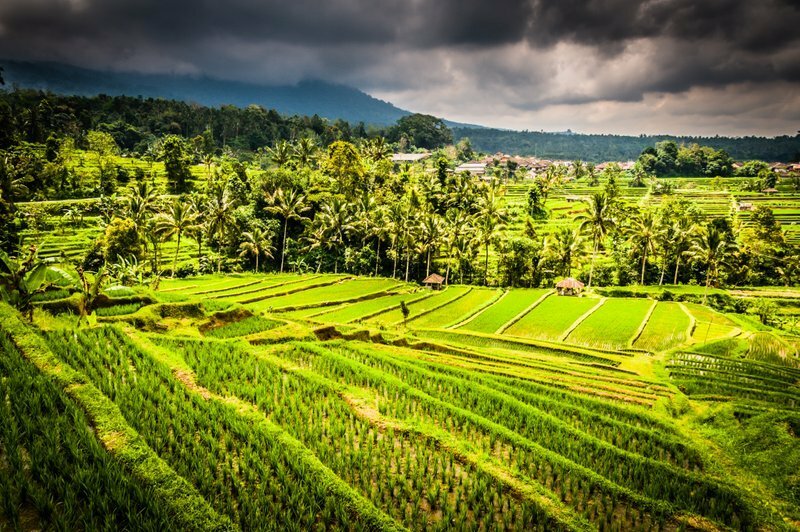 The rugged landscape of Bali and its terrain make for fertile soil which, combined with a wet tropical climate, make it an ideal place for crop cultivation. Water from the rivers has been channelled into canals to irrigate the land, allowing the cultivation of rice on both flat land and mountain terraces. We were able to walk right amongst the paddies. The views were movie stills. The landscape here is over a thousand years old. It was a very special experience. 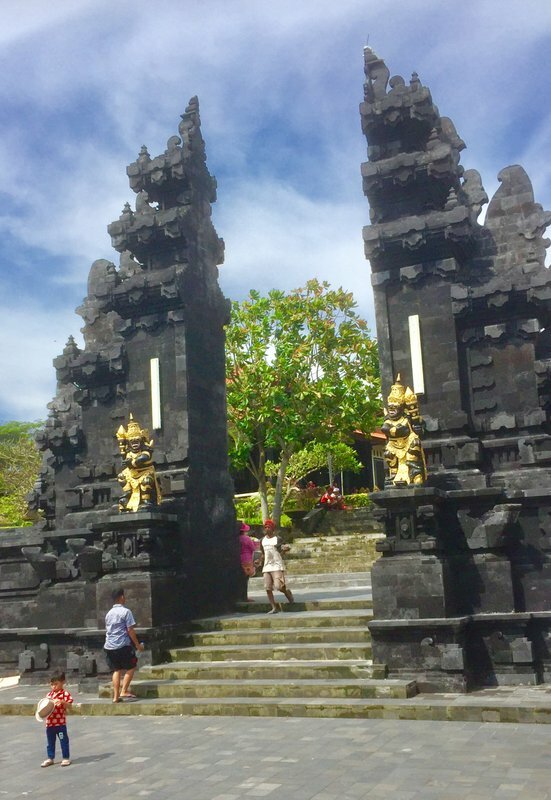 We drove south to Seminyak and en route stopped to visit Tanah Lot Temple, one of Bali’s most spectacular sites and one of the most photographed temples in the world. It is perched on a barren rock outcrop and at high tide is completely surrounded by the ocean. It is only accessible on foot at low tide. The temple was using the low season (Jan-March) to undertake repairs and carry out maintenance to the temple complex. The next day we checked into the Indigo Hotel in Seminyak – an area brimming with restaurants, boutique shops and art galleries. Our last night in Bali was a very special treat – dinner with a Princess. It was an extraordinary experience. We were escorted to the private villa of a member of the Balinese Royal Family – a relative of the late King. 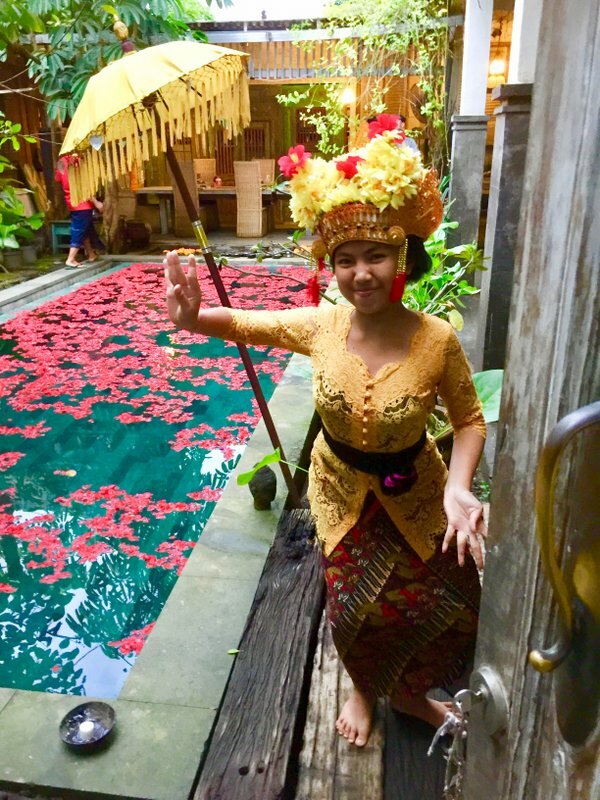 We arrived at her villa and were greeted by a showering of rose petals and a Balinese dancer. We were the only guests. The conversation flowed effortlessly. I had plenty of questions and our host was very candid. The princess treated us to a fabulous five-course dinner which was simply delicious, a culinary highlight of the entire trip. It was an extraordinary dinner, cooked by her private chef and a memorable experience. Andrew J Wood is a travel writer, a regular university guest lecturer and a long-time resident of Thailand. He is also a former hotel GM and Immediate Past President of Skal International Thailand. Andrew is also a Director of Worldwide Destinations Asia Co Ltd in Bangkok.